This article is published in the "Open Source For you" magazine in India in this month September 2014. This article is under the creative commons license. For any queries related to this software, please input your queries through the comment section of this page. Contiki is an open source operating system for connecting the tiny low cost microcontrollers, sensors to the internet. Contiki is preferred because it supports the various internet standards, rapid development, selection of hardware, active community to help and commercial support altogether with a open source license. Contiki is designed for tiny devices and thus the memory footprint is very less when compared with other systems, it supports the Full TCP with IPv6, it handles power awareness where in the device power management is handled by the OS, all the modules of Contiki is loaded and unloaded during the run time, it implements protothreads, uses a light weight file system, various hardware platforms with sleepy routers (to make the routers sleep between message relays). One of the important feature of contiki is the use of Cooja Simulator to emulate if any of the hardware devices is not available. Contiki can be downloaded as “Instant Contiki”. Instant Contiki is available in a single download that contains an entire Contiki development environment. 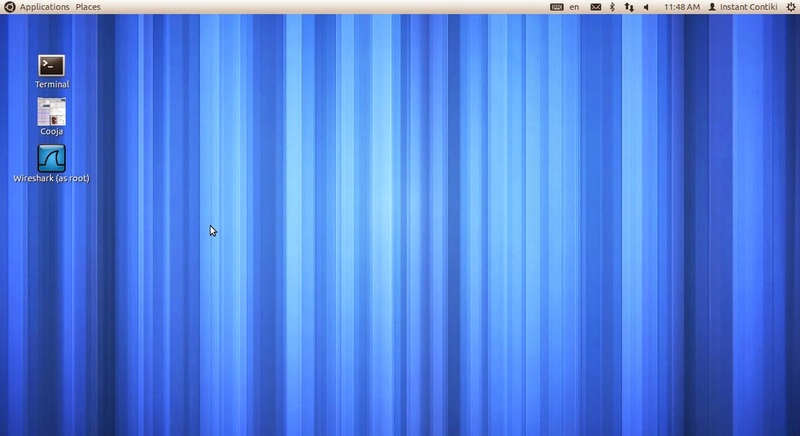 It is an Ubuntu Linux virtual machine that runs in VMWare player and has Contiki and all the development tools, compilers, and simulators used in Contiki development installed. Most of the users prefer instant Contiki over the Source code binaries. The current version of Contiki (at the time of writing this post) is 2.7. Step 2: Download the Instant Contiki virtual image of size 2.5GB approximately (http://sourceforge.net/projects/contiki/files/Instant%20Contiki/) and unzip it. To run with a simulation, contiki comes with many prebuilt modules that can be readily run on the Cooja simulator or on the real ha7rdware platform. 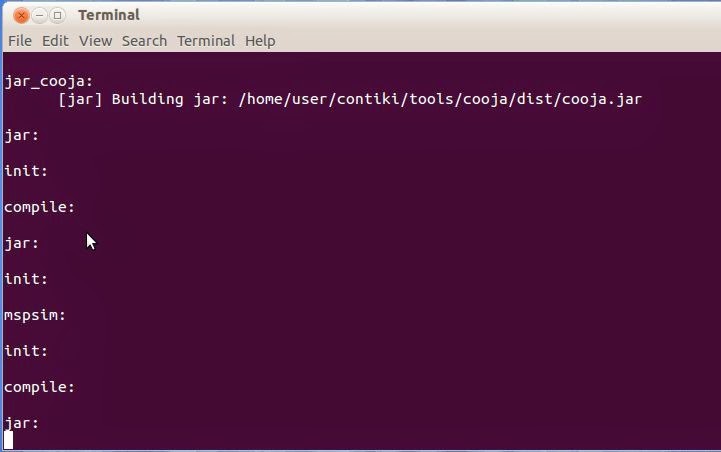 There are two methods of opening the cooja simuator window. You can see the simulation window as shown in Figure 2. 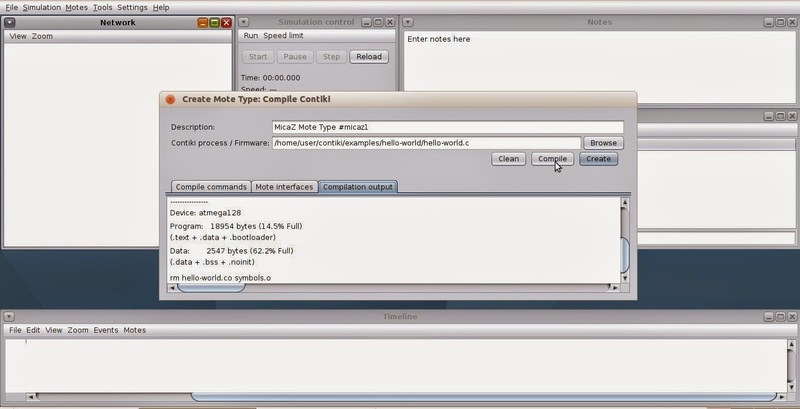 To create a simulation in Contiki, from the File menu → New Simulation and name it as shown in Figure 3. Contiki will generate object codes for these motes to run on the real hardware and also to run on the simulator if the hardware platform is not available. To add a Mote-> Add Motes → Select any of the motes given above → MicaZ mote. You will get a screen like this Figure 6. 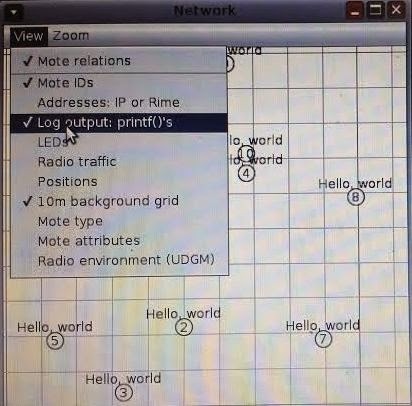 Cooja opens the Create Mote Type dialog, in which the name of the mote type as well as the Contiki application that the mote type will run. For this example click the button on the right hand side to choose the Contiki application and select /home/user/contiki/examples/hello-world/hello-world.c and click Compile. Once compiled without errors, click “Create”. This is shown in the Figure 6. Contiki comes with numerous prebuilt modules like IPv6, IPV6 udp, hello world, sensor nets, EEPROM, IRC, Ping, Ping-IPv6, etc. These modules can run with all the sensors irrespective of their make. Also there are modules that runs only on specific sensors. For example, energy of a sky mote can be used only on Sky Motes, they give errors if running with other motes like Z1 or MicaZ. Developers can build new modules for various sensor motes that can be used with various sensor BSPs using the conventional C programming and can be deployed in the corresponding sensors. Here is the C source code for above hello-world application. Conclusion: Internet of Things is an emerging technology that leads to Smart City, Smart home, etc applications. Over these years, implementing IOT was really a challenge and now there is one such OS contiki is available to start with. Contiki can be very useful for deploying applications like automatic lighting system in buildings, Smart refrigerators, Wearble computing systems, domestic power management for homes, offices, etc.